The National Palace of Queluz is beautiful and well worth a visit. Located about 16 kilometres from all the popular palace sites of Sintra but close to Lisbon, it is often overlooked by many visitors to Portugal. If you want to explore a gorgeous Baroque palace without the crowds, then head here, you won’t be disappointed. Queluz Palace was built in 1747 and was the royal residence for Queen D. Maria I and Dom Pedro III. Despite the 17 year age gap and the fact that Dom Pedro III was Queen Maria’s Uncle, the marriage was a happy one. They say that when Dom Pedro died in 1786, poor Queen Maria started to show signs of madness which escalated when her eldest sign José died from smallpox two years later. She was then confined to ‘Maria’s Pavilion’, away from public view but her crazed screams were heard throughout the Palace. Eventually, her younger son Joao took her to Brazil in 1807 when the French invaded Portugal. The palace interior is pretty impressive – an interesting mix of Baroque, Rococo and Neoclassical styles. My neck hurt from admiring the artwork on the ceilings. 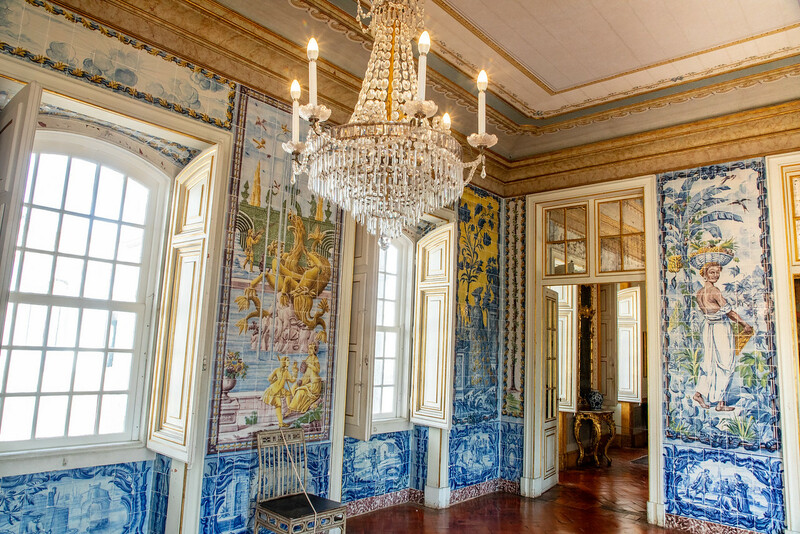 One of the first rooms you enter is the rather impressive Throne Room where Queen Maria I and Dom Pedro would receive their guests. The room is decorated with mirrors, gold carvings and paintings. It was fascinating walking through the palace. After seeing the bedrooms, I can’t believe how small the beds are, but then when we were looking to rent a house in Portugal, we noticed that too. The Tiles Corridor Hallway was gorgeous. The panels represented the four seasons and scenes from classical mythology and hunting scenes. 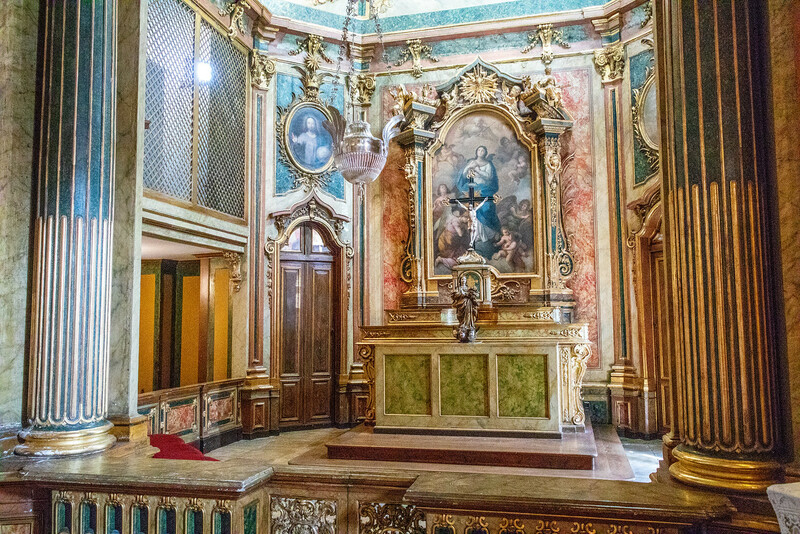 The chapel at Palacio Queluz was one of the first rooms to be completed at the palace and was consecrated in 1752. Both Queen Maria I and Dom Pedro were very religious and would attend mass several times per day. The upper level of the chapel had galleries where the royal family would sit, out of view of the congregation. 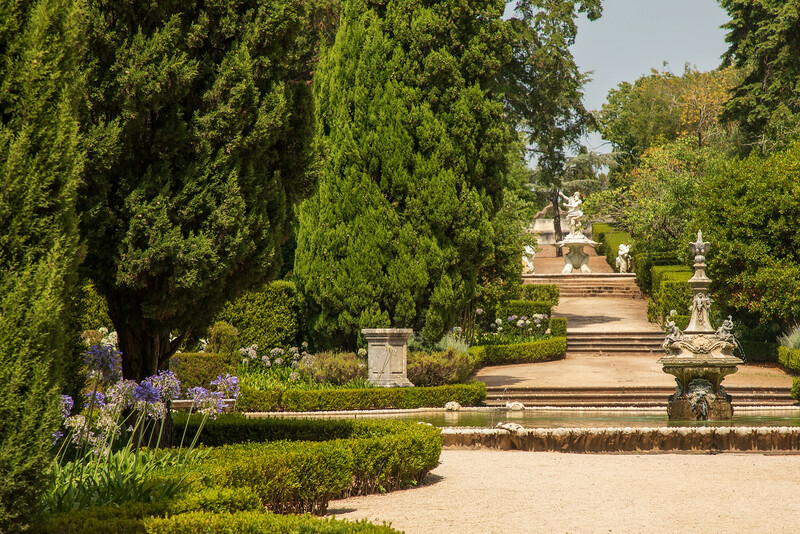 After exploring the interior of the palace, you can take a stroll through the garden. It’s lovely to walk around but we were there in the middle of a heatwave, and even though there’s a lot of shade, it was a bit too hard to walk for too long. 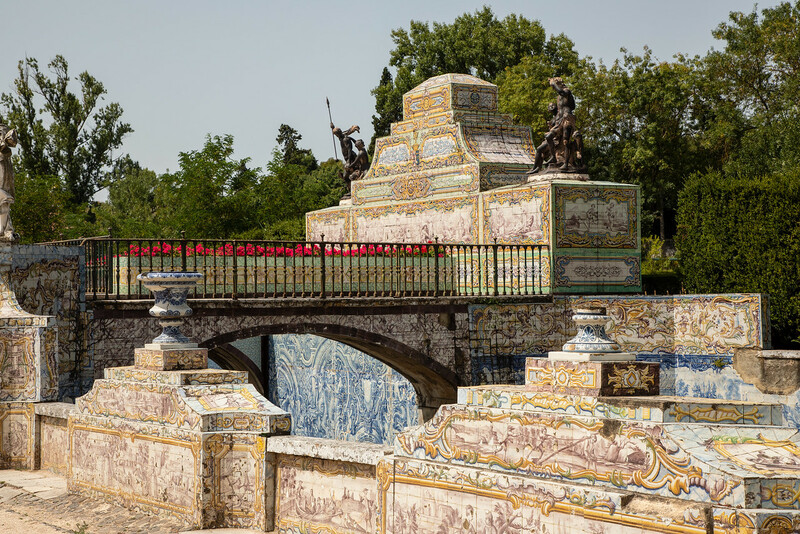 But don’t miss the Canal dos Azulejos where the royal family used to ride a small boat during the summer months. The tiles are gorgeous, decorated with scenes from the 18th century. But now we were hungry and thirsty; we headed for lunch at the Cozinha Velha which was once the palace kitchen and still retains the vaulted ceiling, arches and an old stone chimney. The restaurant is famous for its desserts, but I have to say, I have had better creme brûlées elsewhere! 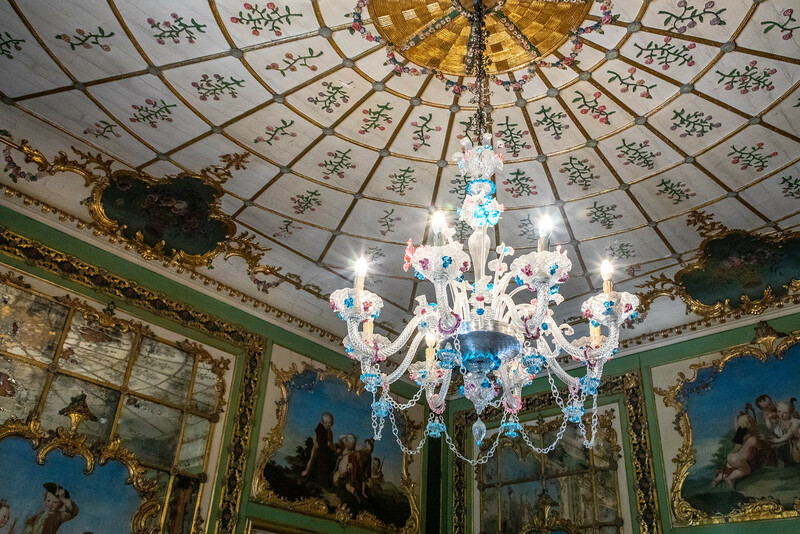 From April to end of October, Queluz Palace is open from 09:00 – 19:00. From November to May, 09:00 – 18:00. Last admission, one hour before closing. 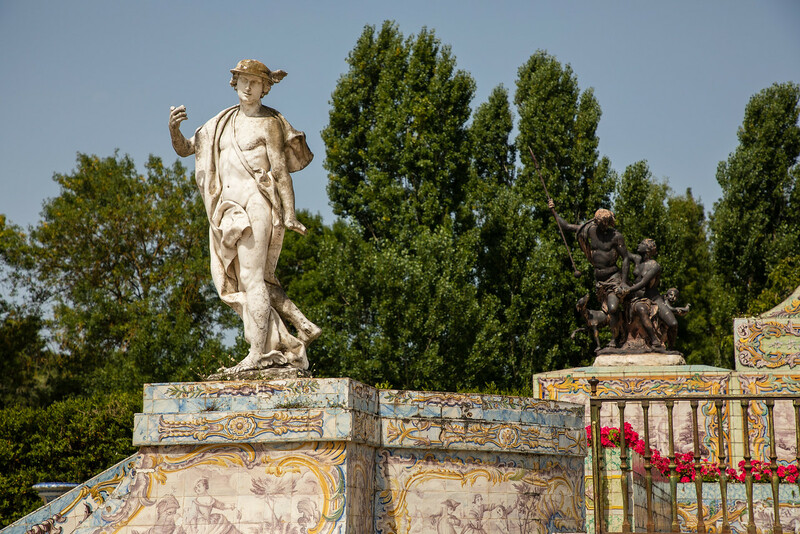 We drove, the National Palace of Queluz is well signposted and easy to reach from the A9. 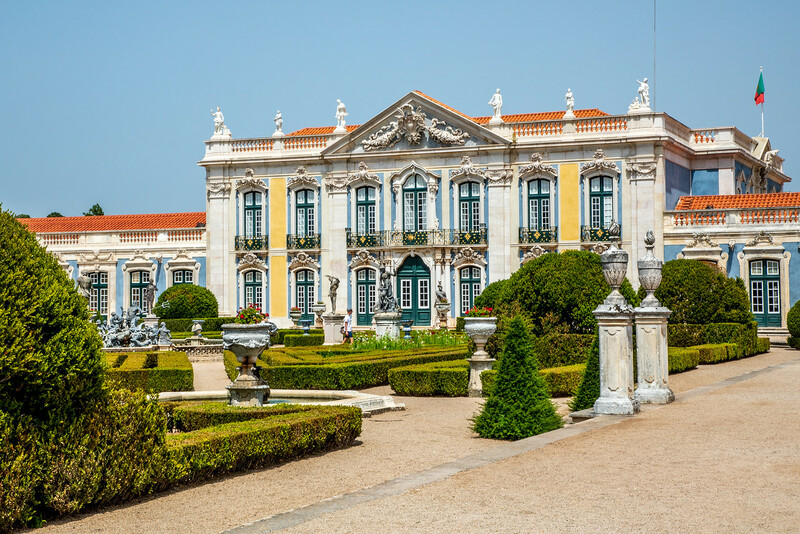 For those wishing to use public transport, Queluz Palace is roughly 16 kilometres from both Lisbon and Sintra. From Lisbon, take the train towards Sintra and get off at Monte Abraão train station. If you are coming from Sintra, get off at the Queluz-Belas station. From both stations, it’s about a 15-minute walk to Queluz Palace. That throne room is incredible! It reminds me of the Hall of Mirrors at the Palace of Versailles. I am also loving that chandelier with the pink and blue accents. SO over the top! Looks totally worth a visit! Yes, I believe they were inspired by Versailles! Wow, beautiful photos for a beautiful place! 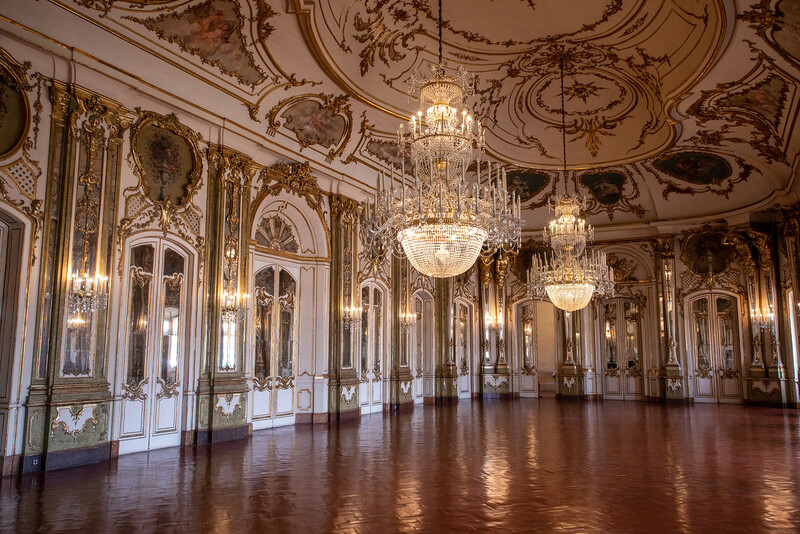 I’m ashamed to say I’m not familiar with Queluz National Palace… wish I was when I lived over that way. I suppose there’s a reason to return. Thanks for the read Sarah, really enjoyed this. Thank you! It was a really lovely and uncrowded palace, wellworth visiting. What a beautiful place with fascinating history! I love historical palaces and the Quelez Palace is one I had not heard of before! It was new to us too and well worth visiting. I’ve never been to Lisbon. When I have a chance, this will definitely be on my itinerary. The palace looks beautiful and the paintings are marvelous. 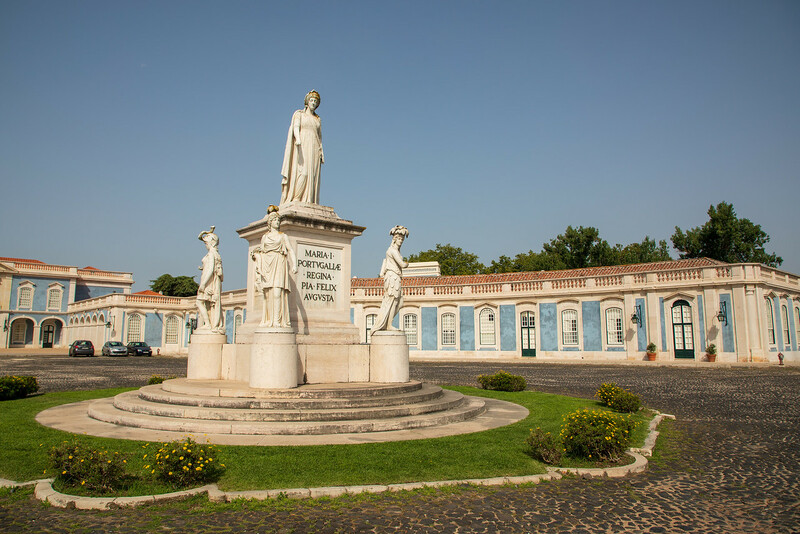 Lisbon is a beautiful city to explore and Queluz Palace is really easy to get to from there. Great article. I love seeing old architecture and learning about history whenever I visit somewhere. It looks beautiful inside and out. It’s a really nice place to visit and although it’s near Lisbon and Sintra, it’s off the usual tourist trail, so no crowds! That is a lovely palace! The chandeliers are so beautiful in the throne room, and each room has such a distinct theme. The garden is truly the most impressive and I would love to see it for myself someday. It looks so opulent. I’m definitely overdue for a trip back to Lisbon and I think this should be high on my list. I’ve haven’t heard of Palacio de Queluz before so thanks for introducing me to it. Great article. The National Palace of Queluz looks so exquisite. It is a relatively unknown gem of Portugal and as you have mentioned does not see many footfalls of tourists. The history of the palace too is quite interesting and the later part tragic as well. The gardens too look magnificent, but the best part is probably the interiors of the palace. Thanks, don’t know about living there, but part of the palace is a hotel, so you could pretend for a while lol. I’ve been three times to Portugal and can’t get enough. I can’t believe I missed seeing Quelez Palace, as it’s so stunning. I like that you give some background to the story behind it too, it sets the scene well! Thanks, I have to admit I had never heard of it until friends took us there. It’s beautiful but off the beaten path, despite being so close to Lisbon. Everyone wants to go to Sintra instead! Wow, what a beautiful palace! The throne room looks absolutely spectacular. I didn’t know this existed so am 100% going to visit when I go to Lisbon. Great article and gorgeous photos! I’ve never heard of this palace… but WOW! How did you guys stumbled there? Did you also know of it beforehand, or was it recommended by friends before going to Lisbon? If I read your article before my trip to Lisbon, I would’ve definitely visited this place! It almost looks like it has Versailles palace vibes. We are planning to visit Lisbon soon, and have been adding must do things to our trip. After reading this post I just added Queluz National Palace. What I do love is how beautiful all the buildings are, inside and out, wow. I can’t wait to see them in person. We just got back from visiting Queluz this morning. Your photos are lovely. You have captured the aura of the palace exquisitely. Thank you! Thank you Mercedes. We have guests coming next week and plan to show them one of our favorite palaces. Beautiful! I am coming over to Malaga, Spain in early April, again, will spend a month or so traveling around. This time, Portugal is at the top of the list!